Vulcan GMS has many paint and coating solutions available for our customers. We can provide coatings based on your specs or specific needs. If you are not sure what coating solution to use. simply contact us and we can review your application and offer the best solution. 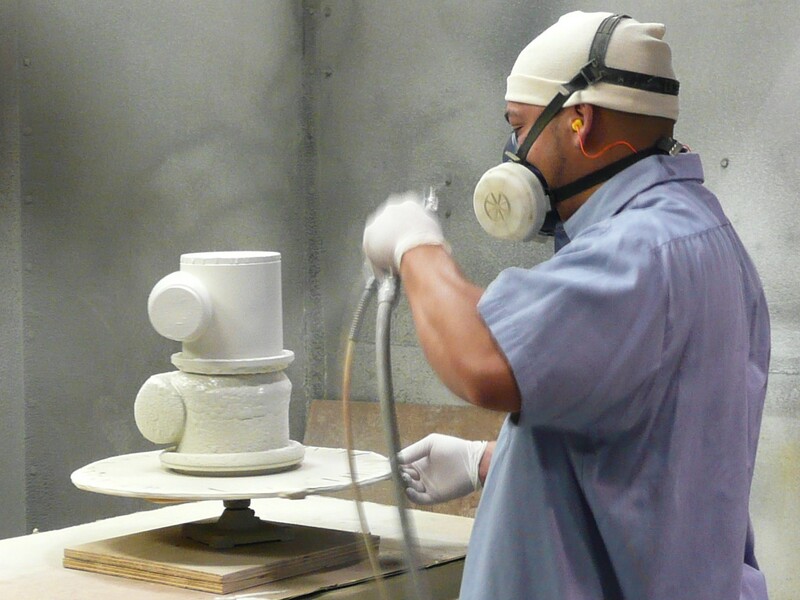 Vulcan GMS has its own paint and powder division for applying coatings to any product we produce. Powder coating is a very durable coating that is applied through an electrostatic process. The product being coated is electrically grounded which can be done on a hanger rack or on a table depending on the product size and weight. The powder is electrostatically charged and applied evenly. After the powder coating is applied, it must be cured through an oven heating process which typically ranges from 325 to 475 degrees for 15 to 40 minutes. 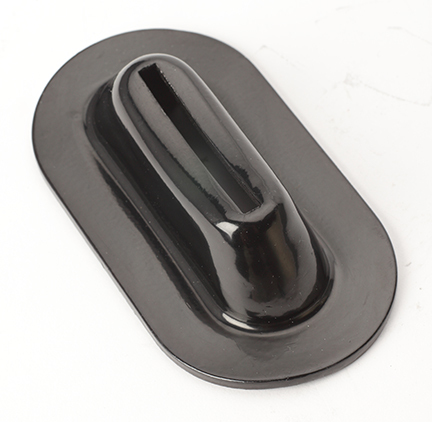 After curing, the result is a nice hard coating that forms a shell over your product. Vulcan sprays many powders and textures to fit our customers’ needs. We can use any powder in our shop. If your specification calls for a non-standard custom powder, there may be a minimum charge since powder is sold by the pound. Depending on application needs, there may be custom powder left over. Vulcan also can apply powder to lead and we offer several solutions for products used in X-ray tank applications to seal lead surfaces. Vulcan GMS can offer multiple solutions to our customers in two types of coatings: basic coatings and traditional paint coatings. Many customers simply want a coating on lead products to reduce contact with lead and to seal the lead from oxide development. For basic coatings such as these, we can offer a few types of primer based coatings to cover the lead. This is a basic paint in monochromatic colors such as gray and black. This basic coating process offers a solution at a low cost. Vulcan also has a full paint shop where we can offer any type of wet paint coating. We have the ability to hang parts on our line or, for larger parts, we can coat them on a table top. 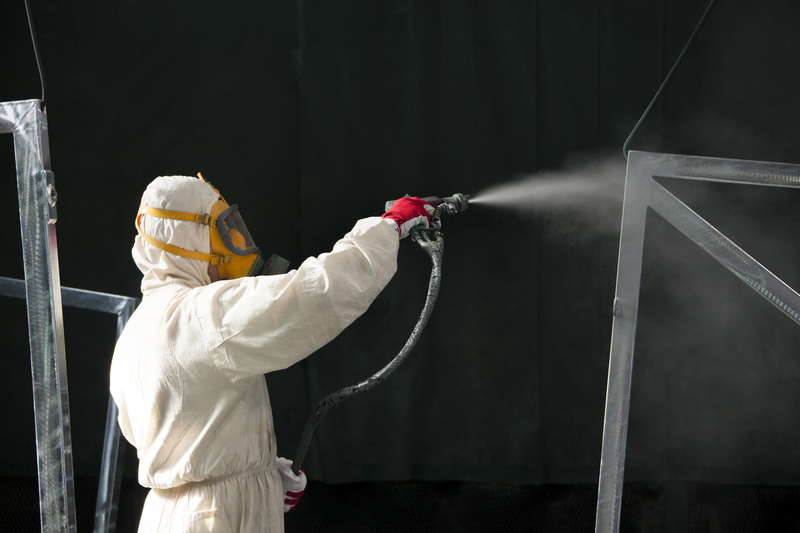 Custom coatings may carry a surcharge based on minimum paint order requirements. However, we spray many types of coatings including almost all Sherwin Williams paints. Contact Us for your painting needs!